Health fairs have been used across Ontario to increase awareness of certain health issues and to provide information on various health and community services, Health fairs generally consist of a number of exhibits from service providers; workshops are sometimes also offered. 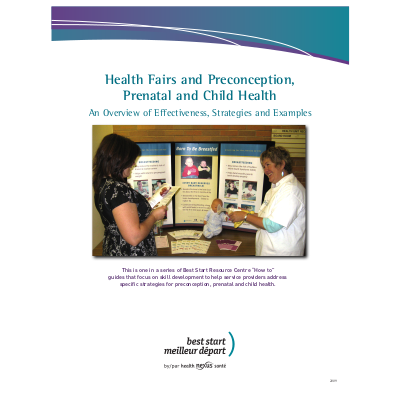 This document examines the evidence for health fairs and shares information from service providers who use health fairs as part of their range of maternal-child services. Such fairs are offered to men and women who are planning a pregnancy, expecting a baby or who have a young child.